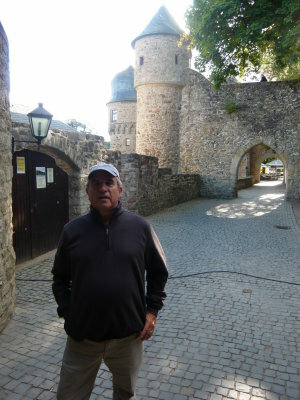 On our return trip to Ramstein-Miesenbach, where Stan and I were staying at the Hotel Anna, we did some sight seeing and stopped a few places along the way. The Rhine River goes generally from south to north in Germany eventualy passing into the Netherlands and on to the North Sea. 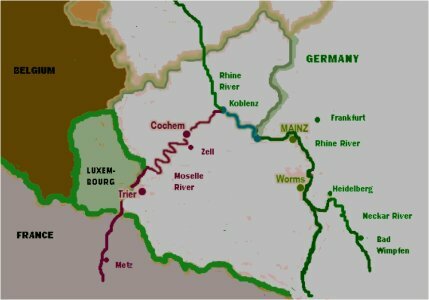 The Mosel River originates in France, west of Germany, and heads northeast toward Germany. When it crosses the French border, it becomes the border between Luxembourg and Germany continuing on to the northeast after leaving Luxumbourg until it flows into the Rhine River at Koblenz. 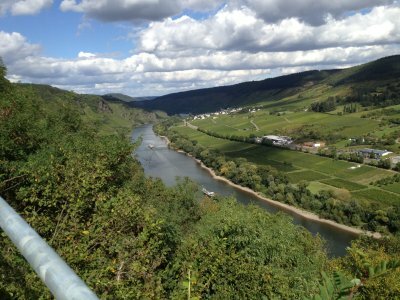 The Mosel River Valley is considered to be Wine Country in Germany. The picture below shows the region of Germany that includes the Mosel River Valley. In the picture the river is labeled Moselle, the German name for the river. The map also shows Worms, which we visited the next day, and Frankfurt, the city where we caught out return flight to the United States. The Mosel River is east of Malmédy, where we had spent the morning. 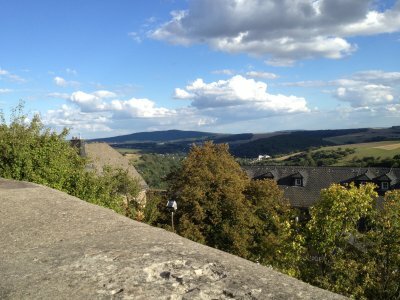 And when we left Malmédy, we headed east toward the Mosel River, which we crossed near Bullay, Germany, which is less than 10 miles south of Cochem on the map. 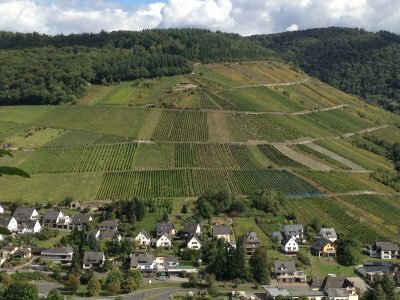 As we were traveling along the Mosel, we took some shots of some of the vineyards and villages along the Mosel. 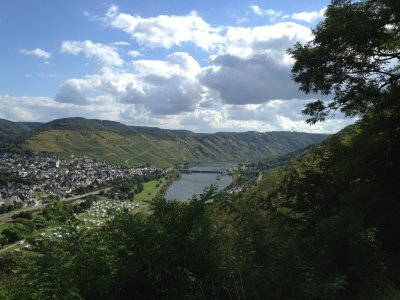 The picture below shows a view of the Mosel River Valley. 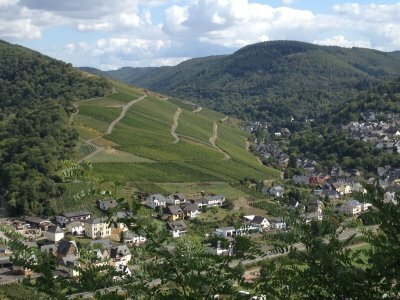 The picture below is another of the Mosel River Valley with the river, a village, and vineyards on the hillsides in the distance. The picture below is another of the Mosel River Valley with a village and vineyards on the hillsides in the distance. We are not absolutly certain where the pictures of the wine country and village shown above were taken. However, we believe they were taken near Enkirch, Germany. As we left the Mosel River Valley, we drove up some steep hills until we reached a plateau along which we drove for some distance. While on this plateau, we came upon fields with beautiful lavender flowers. The picture below shows one of these fields. 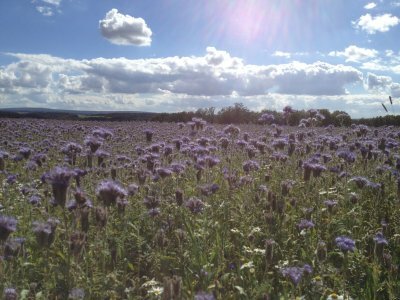 The picture below is another shot of the field of lavender flowers. 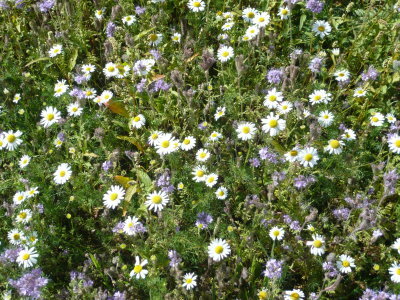 The picture below shows a close-up of the lavender flowers also shown in the pictures above. Mixed among the lavender flowers are some daisies, which apparently don't grow as tall as the lavender flowers. 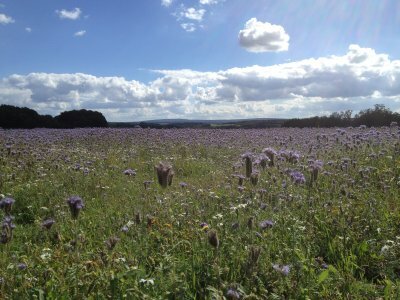 As a result, pictures taken across the fields show only the tallest flowers, the lavender flowers, and give glimpses of the daisies only in the foreground. 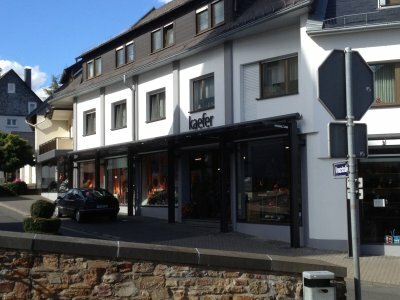 Our next stop was in Kaefer's Kitchen Store in Sohren Germany. At one time there was an American Air Force base, Hahn Air Force Base, about a mile northwest of Sohren. My cousin Ray Nixon lived in Sohren when he was in the service and stationed at that base. Kaefer's in Sohren catered to the Americans on the base. After the base closed in 1993, Americans kept coming to Kaefer's from all over Germany and Belgium. In our case, Americans came all the way from the United States! Today a large portion of Kaefer's business is still with Americans. Before leaving the U.S. for Europe, Jan gave Stan a shopping list and orders to stop at Kaefer's and pick up some things. Apparently Jan was one of those Americans who was a regular at Kaefer's during the seven years they lived in Germany. Stan got some knives and other things for Jan and him to give as Christmas gifts. While there I bought a nice set of Wüstoff cooking knives and a great cookbook with German recipes. 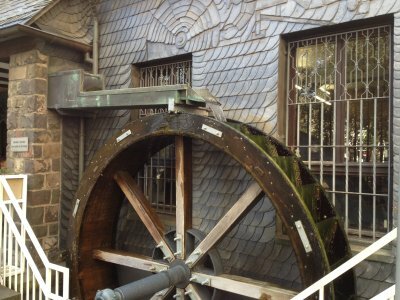 From Sohren we went to Idar-Oberstein, where we visited a couple of things including the waterwheel shown in the following pictures. 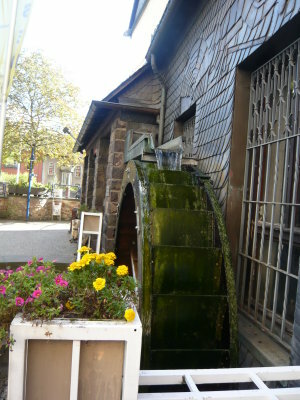 The picture below is another of the waterwheel in Idar-Oberstein. The picture below shows a huge rock formation with a white building that has been built into the rock. 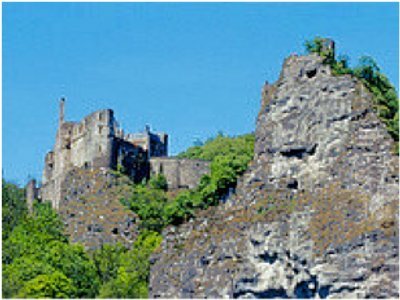 This is also in Idar-Oberstein. The building is actually a church. And it is literally built into the rock. 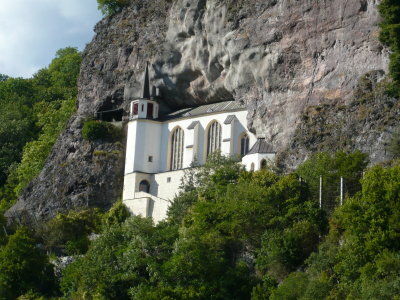 The picture below is a closer view of the church that was built into the rock at Idar-Oberstein. The story behind why the church was built into the rock is an interesting one. Two noble brothers lived in a castle at the top of the rock into which the church is built. The nub at the top of the rock in the first church picture above is probably part of the remains of the castle. Both brothers were courting the same girl without the other knowing. The girl was from a noble family that lived in nearby Castle Burg Lichtenberg, which is discussed below. While one brother was away on a trip, the other won the girl over and married her. The the loser became angry and threw the winner out the window of the castle to his death on the rocks below. Almost immediately he was remorseful. As penance, he built the church at the spot on the rocks where his brother landed. The castle of the infamous squabbling brothers above is not visible in the picture above. 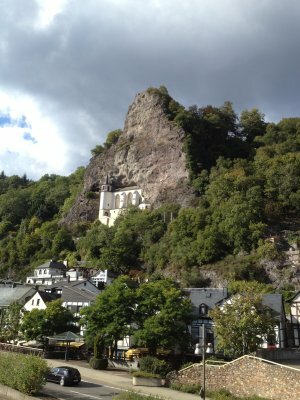 The picture below shows the ruins of the castle on the rock above the church. The surviving brother died soon after the church was finished. Both brothers were buried together in the church built by the survivor. We aren't sure where the woman who caused the problems between the brothers was buried. 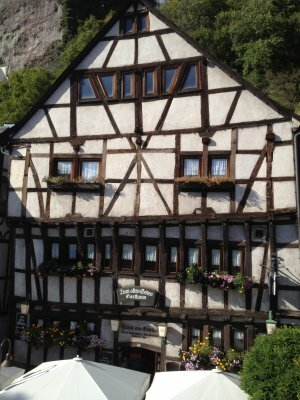 The picture below shows an old half-timber building in Idar-Oberstein. It was built in 1392 and is claimed to be the oldest half-timber house in the Nehe Valley. It serves as a restaurant and guest house. The name of the restaurant, Zum Alten Goten, means something like: To The Ancient Goths. 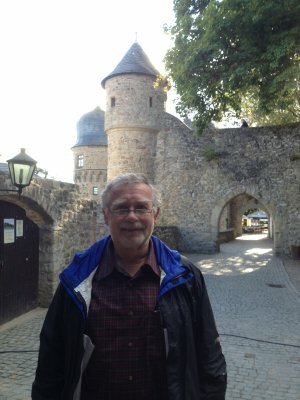 When we left Idar-Oberstein, we headed toward Castle Burg Lichtenberg, which is near Thallichtenberg, Germany. 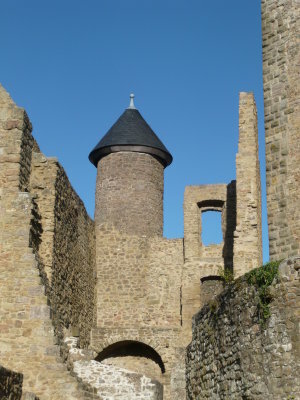 The picture below shows a part of the castle. Castle Burg Lichtenberg was built around 1200. It changed hands several times over the years during struggles between rival counts and dukedoms. In the 1790s the territory around it was taken and controlled by troops of the French Revolution. In 1799 a fire destroyed much of the castle. The castle fell into disrepair for many years. In 1895 it became a historical monument and was placed under historical monument protection. 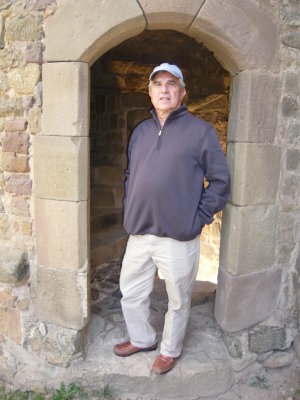 The pictures below show Stan and me at Burg Lichtenberg. The photo below is another view of Castle Burg Lichtenberg from a greater distance. It shows more of the castle ruins. 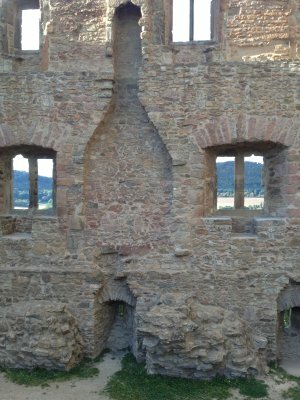 The picture below shows some of the interior of Castle Burg Lichtenberg. 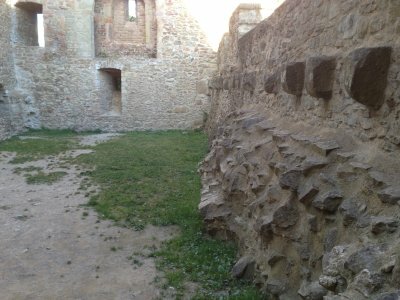 The picture below shows more of the interior Of Castle Burg Lichtenberg. 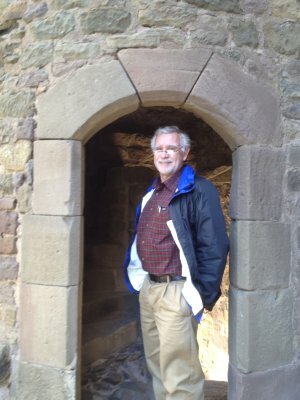 The pictures below are of Stan and me standing in the archway of a door to one of the towers in Castle Burg Lichtenberg. As I recall, the stairs up the tower were blocked off to prevent people from going up the tower. The picture below is of the countryside around Castle Burg Lichtenberg. It was taken from one of the walls around the castle. The village of Föckelberg, where Stan and Jan lived for the seven years they were in Germany, is just over the hill in the distance in the picture. 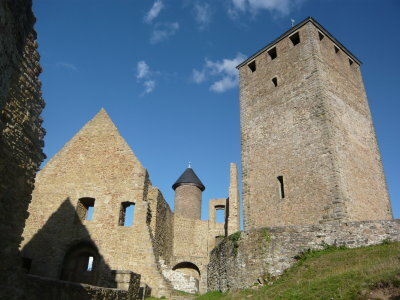 The GPS coordinates of Castle Burg Lichtenberg discussed above are 49.556447N, 7.357909E. Click on the coordinates to see the location on Google Maps. All in all, we had saw a lot of great things on our return from Malmédy to Hotel Anna at Ramstein.